I’m back! After a short break to rest and recover from last season’s racing, training and fun times on skis has started up again, and so has the MYSL blog. I’ll be writing every month during the summer, and a couple times a month during the race season. This is my last post for you for a little while, so it’s a longer one. I want to share with you the story from World Championships, where Kikkan and I won the Gold medal in the skate team sprint race. It was a big deal for the USA because it’s the first gold our country has ever won at a World Champs! 2.24.13 World Champion in the house! – the World Championship races! Everybody knows that the Olympics are held every 4 years, but the World Champs is every 2 years – the year before and the year after the Olympics. This year the World Championship series is in Val di Fiemme (where I wrote to you from the Tour de Ski) and once again the US Ski Team is staying in Predazzo, a town near the race courses. 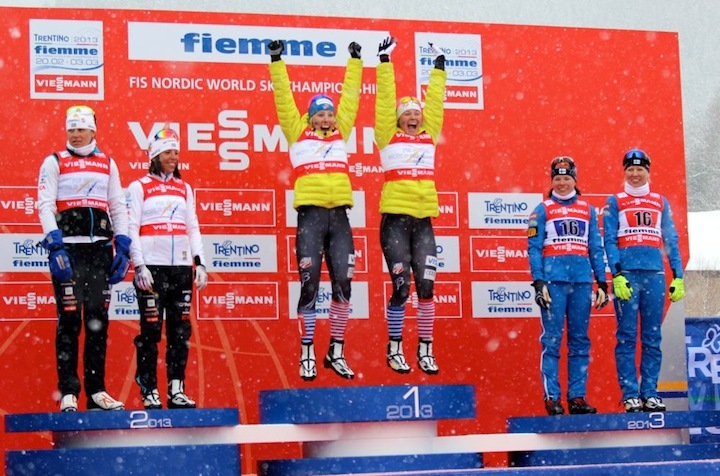 There are Ski Jumping events, Nordic Combined (ski jumping + cross-country skiing) and Cross Country races. Read more about 2.24.13 World Champion in the house! Hey MYSL Kids! Last time I wrote to you, I was in Russia, checking out the Olympic venue for next year’s Winter Games. It was very exciting and different to be in a country with some customs that are similar, and some totally different than ours. I raced twice last weekend; the skate sprint, and the 15km skiathalon. This post is written to you from Sochi, Russia – the longest city in the world! It runs along the black sea, and I’m staying up on top of a mountain, at the ski venue where the 2014 Olympics will be held next year. Last time I wrote to you was the first day of the Tour De Ski, and I was in Oberhof, Germany. Now I am writing from Predazzo, a small twisty-turning town in Italy, in the Val di Fiemme (a big beautiful valley in the mountains with many other small towns). Well, the Tour is finished, and I am a very tired but happy skier! Hello MYSL Kids! I'm writing to you from our hotel room in Oberhof, Germany, 3 hours before the start of the Tour de Ski! I flew over December 23rd and spent Christmas here in this little rainy city, which is the center of biathalon training for the German team. Hello MYSL kids! The last two weekends were pretty exciting for North American skiers, with the World Cup races coming to Quebec City and Canmore, both in Canada. Although not every skier in the world came across the ocean to race, many of the best racers made the trip. Hey MYSL kids! I'm writing to you from Ruka, Finland. Last week I was in Gallivare, Sweden, and some exciting things happened! Hello everyone, greetings from Finland! This will be the first post in a series of travel and skiing blogs for the MYSL kids. I hope you enjoy reading! Cross-country skiing is a great way to be able to see the world, visit other cultures, and meet skiers from across the ocean!